No additional cost to move your bike between airport, resort and home. Enjoy a lighter trip without heavy bike. Your bike and luggage are waiting for you at resort or your home in advance. We offer various shipping services at competitive rates. We arrange pick-ups at scheduled time frames from your door, and deliver your bike to your resort, hotel or home at destination. You may drop off your bike at over 250,000 locations worldwide. We assist you in preparing the customs documentation for international shipment. We monitor every shipment and work with both you and the carrier for any assistance that is needed. 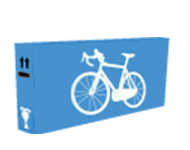 We provide up-to 6 months of free storage services for your bike or sport equipment. US Domestic shipment: please lock your bike case by TSA approved locks or cable ties. International shipment: please ONLY use Cable Ties to lock your bike case. Put shipping labels and document inside the label pouch, tracking barcode facing outside. Stick the pouch tightly to a luggage tag, and secure the tag to the top handle of your bike case. Or stick the pouch tightly to the bike box. Put an additional copy of label and document inside bike case. Or tape an additional label on the bike box with clear tape. Take a full picture of the labelled bike case/box, with the tracking barcode.